If you’ve never had the pleasure to visit a developmental pediatrician, let me tell you, it’s not all that fun. Well, actually the appointment itself isn’t so bad; it’s the pile of paperwork that comes beforehand that can cause parents like us to lose our minds. Pages and pages of circles to fill out on our child, things like “fill in the words your child is saying” or “what concerns you most about your child?” or “what is your child’s strength?” and a plethora of yes’s and no’s as to what our child is doing. I suppose if your child were a genius this wouldn’t be so bad, but when your child is what they’d call “behind” his peers, filling out this paperwork isn’t what I’d consider fun. It’s a reminder that our son is indeed not like other three-year-olds (not that we needed to be reminded, all we need to do is leave our house or look out the window). On Tuesday we saw Elijah’s developmental pediatrician and besides all the paperwork that came ahead of time, the appointment was really, really good. He got to see Elijah’s dancing skills, which made him laugh with joy. He told us he was really worried about Elijah the first time he met us because of his self-injury (which, by the way, has almost completely resolved). He also mentioned that he wasn’t so sure Elijah even had cerebral palsy when he first met him, but then looked me in the eye and said, “He does have cerebral palsy” as if we haven’t known this for almost three years. “Functionally, he’s doing really well,” he said and I’d have to agree. Elijah has never seen his MRI and doesn’t seem to realize that he had a massive injury to his brain. Can I just stop here and praise God? Elijah really is doing so, so well. Not to minimize Elijah’s struggles, as Elijah has his fair share. His doc pointed out that Elijah tests below the 1st percentile in all areas, which means that we shouldn’t have anyone squabble as to if he’s eligible for services. I don’t put much credence on developmental age, but Elijah is around the 17th month level, pushing 18 months. It doesn’t really mean much, as his skills are scattered all over the place and 17 months is just a median. We’re actually excited by this news. He seems to be developing more play skills and it’s so thrilling to see. There are so many other changes in our son that cannot be charted or graphed, but it’s nice to see that some of the changes are actually appearing on the charts. The doc also said that we have a really good treatment plan in place (which is a mixture of ABA therapy, preschool and some supplemental OT and speech this summer). Lots of stuff going on and Elijah is thriving. He asked if we wanted to see him in another six months or a year. “A year,” we said. Yes, I think that will do. Tonight, standing in my kitchen, I heard something hit the floor with a little plop. It was a tiny little spoon. You see, while Elijah has been opening and closing our drawers for awhile now and has been startling me with his whoosh-slams, he never took anything out of the drawers. That is, until tonight. He stuck his little hand in the drawer and soon there were all sorts of measuring spoons and Elijah-sized forks on the floor. While I know this is probably going to get annoying in about two days, at this this moment I'm thrilled. 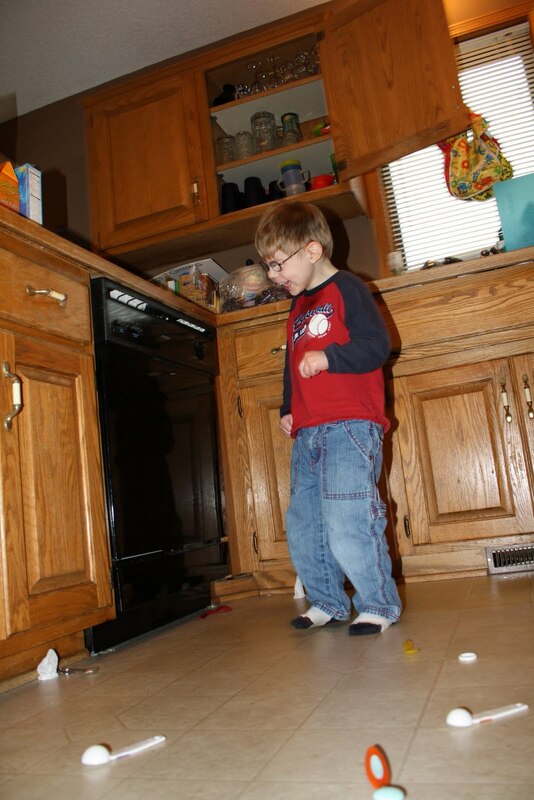 I think I've been hoping for Elijah to dig in my cabinets since he could walk. This is what kids do, people. It's one of those quintessential things I've heard parents complain about...their kids digging in their cupboards. And therein lies one of the blessings in parenting a child with special needs - hoping for and rejoicing in these things that I definitely would have taken for granted otherwise. I know this is old news for most three year olds, but it's a big deal for this three-year-old. And, well, you'd better believe we're proud that our kitchen floor is covered in spoons. I think it's Spring in Minnesota. One can never be sure, but it seems the nicer weather is here to stay. I love the changing of seasons. I love the little buds that appear in the ground in the Spring and the tiny little leaves that form on the trees. Every year it seems like a miracle that winter is over. A wonderful side benefit of seasons is how they give us a gauge on how much Elijah is changing. Just as the seasons change, Elijah changes. Every winter we say, "Look how much better he is at navigating through the snow." And every spring we notice changes too. This spring, we're noticing how much more he's taking in the world around him. We've taken Elijah on a lot of walks in his life and often he'd spend a lot of the time bent forward with his mouth on the stroller. It was quite a source of stress for me. I didn't like that he did it, but I couldn't get him to stop doing it. Walks around our neighborhood were often filled with grumpiness for me as I tried to figure out how to get him to sit up straight - and happiness for Elijah as he thoroughly enjoyed the vibrations of his stroller on his teeth. This spring, Elijah isn't mouthing his stroller nearly as much, but rather sitting up tall and looking at the world around him. It's quite a remarkable thing to witness. "Good head up!" I'll tell him, internalizing what I've learned in ABA: reinforce the behavior that we want to see. We talk about the things that capture his attention, teaching as we go. When the wind blows and causes the dead leaves on the trees to rustle, Eli stops and looks. He's internalizing more, learning by living - something most children do without anyone even thinking twice about it. And I'm learning too, learning to appreciate and take note in the changing of seasons and the changing of Elijah. Nothing ever stays the same and for that I am grateful. P.S. Elijah's replacement glasses came in already. Fast service! P.P.S. Random purple pajama photos are from January and really have nothing to do with this post. We've had these glasses for less than a month.